Cooking by gas as well as heating is now very common and there is a great variety of appliances for its use in this way. Cooking by gas is less expensive and less troublesome than by coal, oil or wood and is more healthful on account of the absence of waste heat, smoke and dust. A gas range is always ready for use and is instantly lighted by applying a match to the burner. The fire, when kindled, is at once capable of doing its full work; it is easily regulated and can be shut off the moment it has been used, so that if properly managed there is no waste of fuel as in the case of coal or wood. The kitchen in the summertime may be kept comparatively cool and comfortable. 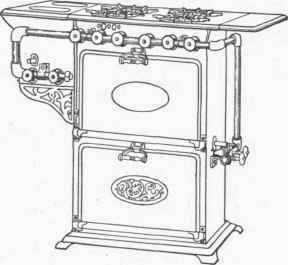 Gas stoves are made in all sizes, from the simple form shown in Fig. 51 to the most elaborate range for hotel use. A range for family use, with ovens and water heater, is shown in Fig. 52. Fig.. 53 and 54 show the forms of burners used for cooking, the former being a griddle burner and the latter an oven burner. A broiler is shown in Fig. 55; the sides are lined with asbestos, and the gas is introduced through a large number of small openings. The asbestos becomes heated and the effect is the same as a charcoal fire upon both sides.